est Cola in Thailand has signed a partnership with Manchester City to become the club’s official soft drinks partner. The club has also announced that it’s to launch a Thai-language version of its website. The deal was announced during a week-long visit to Bangkok, which will see players take part in a series of “partnership activations” before heading to Indonesia. 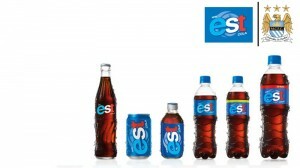 “est Cola is a young dynamic brand with huge potential. The scale and speed of their success demonstrates Thailand’s appetite for brands that are not only innovative, but ambitious also. We’re proud to be part of est Cola’s journey and look forward to working together to engage and inspire Thailand’s legions of football fans,” said Tom Glick, City’s chief commercial & operating officer. As part of the 2 year deal, est Cola have filmed a television ad with players, which will be aired to the country’s population of 69m. The club’s crest and players will feature in both below and above the line advertising campaigns and in store point-of-sale. “est Cola look forward to working in partnership with Manchester City, in order to not only drive brand growth within the international carbonated soft drinks industry, but also domestically among Thai consumers,” stated Dhitivute Bulsook, President of Sermsuk Public Company Limited (owner of est Cola).